It's a perennial problem for kids: Summer brain drain. While the learning loss that many young people face when spending their days in the pool rather than the classroom may be troubling for most parents, the seasonal harm to students in low-income communities is even greater. That further widens the achievement gap between disadvantaged and middle-class teens, according to the National Summer Learning Association. But, some lucky eighth graders from New York City and Westchester County have an antidote: Project Restaurant. The 17-year-old summer program offered by the Harlem Educational Activities Fund (HEAF), a non-profit supplemental education and youth development organization, allows budding top chefs to cultivate eatery concepts while learning about design, marketing and business financing. 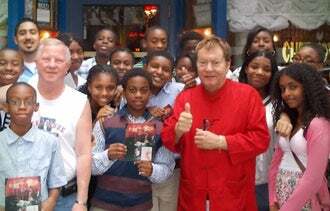 This year's Project Restaurant class with Jean-Claude Baker at Chez Josephine in New York City. In this summer's latest batch, which just wrapped up on August 10, twenty-four students worked closely with Jean-Claude Baker of the iconic Manhattan restaurant Chez Josephine and executives from Capital One Bank to build a workable business plan to run a successful restaurant. Visits to local joints and meetings with restaurateurs, financiers, marketing pros, architects and other business consultants help students draw inspiration and learn about the daily challenges and struggles of launching an up-start eatery. The month-long program culminates with students presenting their restaurant concept to Baker, Capital One executives and community business leaders for feedback. Though HEAF isn't aware of any of its Project Restaurant graduates going on to start up actual eateries, the program has definitely increased students’ interest in becoming entrepreneurs, says Tanya Wiggins, a program director at HEAF. "Project Restaurant instills an entrepreneurial spirit in our kids while teaching them the skills they need to develop a business from scratch," she says. Perry, a student at Salesian High School in New Rochelle, N.Y. and a 2008 Project Restaurant grad, says the program planted the seed for his dream career. Due to Perry's young age, HEAF asked that we not print his last name. I had the opportunity to go to some of New York City’s most esteemed restaurants and to learn from their chefs, owners and managers," says the high school senior. "After graduating college, my goal is to own my own restaurant." How do you think a program like this could have the greatest impact? Leave a comment and let us know.